It’s been a few months, but who can forget the McConnissance, Matthew McConaughey’s triumphant return to real acting in real roles, starting with small indies like Mud and Killer Joe, gaining speed with cameos in Wolf of Wall Street and Magic Mike, hitting fever pitch when he won an Oscar, and winding down with a home-run performance in HBO’s True Detective? Since March’s Academy Awards ceremony, McC. has kept his profile low. It’s been over a year since we’ve seen him shirtless (and McConaughey's probably not in the Magic Mike sequel, so it might be a while). He’ll likely be back in time for the Emmys, where he’ll be competing with his eight-episode performance as Detective Rust Cohle. Many have called it the best work of his career, even better than his Oscar-winning role in Dallas Buyers Club. But HBO has decided to enter True Detective into competition as a dramatic series, not, as many predicted, a miniseries. While TD is a recurring series, each season will change cast, setting, and storyline, which, since American Horror Story broke new ground by doing the same, has been a passable credit to enter into the much less competitive Miniseries category. That loophole led to quite a few extra nominations for AHS that would have never snuck through in the ultra-competitive Drama Series field. Now, more and more shows are jumping on the stretched definition of “miniseries” to enter. But HBO demurred, which doesn’t necessarily make sense — unless you look both backwards and into the future. Until 2014, “miniseries” was paired with “TV movie,” the sort of empty category filled with terrible “wife in peril” films and PBS historical dramas (in the days before Downton Abbey made them cool). But HBO has been on a quest to turn around both genres. Their last few original movies — Behind the Candelabra, The Normal Heart — have the sort of star power and production value of theatrical releases, only their “tough” (read: both frankly tackle LGBT issues) subject matter relegating them to television. And True Detective has drawn banner ratings for the network, critical raves, and even the slightest details about it were enough to send the entire Internet into a frenzy. So it’s no surprise that they’d want one of their best dramas to be competing in the best category, or at least the one that draws the most respect. It’s also going to be expanded in the next few years, from five nominees to seven, just as several prestige dramas like Breaking Bad and Mad Men conclude, leaving plenty of new space in the field for TD, especially since True Detective probably will only go three seasons. In fact, the miniseries category is just as stacked, with Fargo, Downton Abbey, and AHS all competing. So HBO might seem like they’re taking a chance, but the network knows what it's doing… there’s a reason they always manage to rack up the most nominations. But this means McConaughey has very stiff competition. Jon Hamm will certainly be nominated for his so far unrewarded performance of Don Draper. Kevin Spacey will certainly be back, and he has two Oscars. But the juggernaut is definitely Bryan Cranston. This is Cranston’s last hurrah before he truly says goodbye to Walter White. Not only will voters get caught up in the sentimentality of the last chance to reward one of their favorite shows, BB’s season was also mind-blowingly awesome. Cranston picked up a Tony Award in the offseason, his alternative to McConaughey’s Oscar, and while he has one Emmy for Breaking Bad, it seems almost criminal to let him leave the character behind without two. Counterpoint: this is the one and only chance for voters to reward McConaughey, and his performance can go toe-to-toe with Cranston’s, without the luxury of six seasons to build Rust Cohle. Instead, McConaughey works the two timeframes of the show, showing through opposition how time has warped and aged Cohle. He’d be the default pick in the miniseries category, no contest. 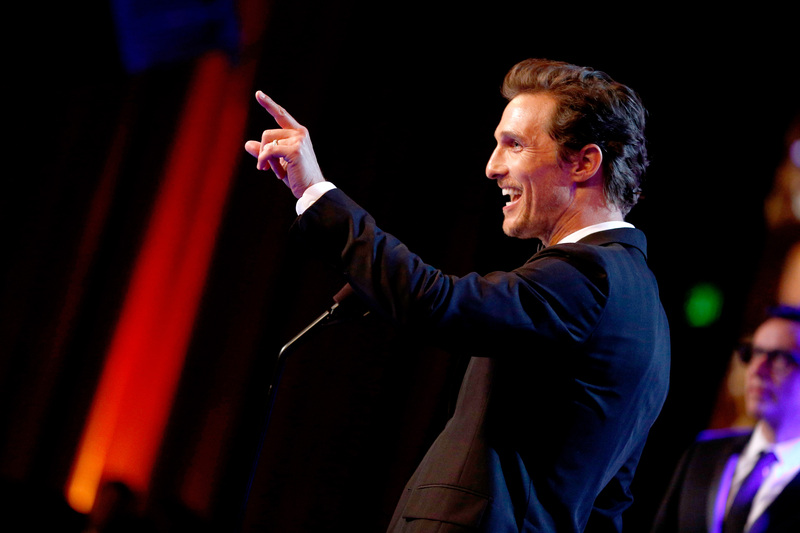 So this is the biggest, best challenge of the McConaissance yet. Momentum has switched back and forth between the two actors, and ultimately, it boils down to this: what will voters want to reward? The culmination of six seasons of Breaking Bad, or the finite nature of McConaughey’s eight episode revelation? This far out, it’s impossible to say, but the Critic's Choice Awards did choose him over Cranston just a few weeks ago. If McConaughey can pull off a Breaking Bad coup, he’ll truly have accomplished a hat trick. Plus, you never know… even if he loses, he might have tricked everyone by re-upping for #TrueDetectiveSeasonTwo.